We are your not-for-profit community animal hospital. A year ago, the Regional Animal Protection Society opened the RAPS Animal Hospital. This full-service, not-for-profit veterinary facility is truly community-owned and operated. We know that B.C. is an expensive place to live and the health of your animal, who is part of your family, is important to you. 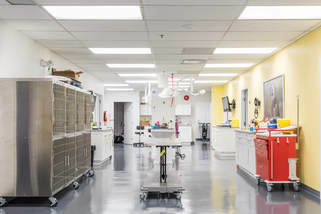 Our bottom line is not profit … it is making animal healthcare more affordable for B.C. residents and, where required, providing them with assistance healthcare programs. This also helps RAPS save and improve the lives of as many animals as possible. Special Offer to Members of BCGEU. ​You make an important contribution to our province. RAPS is collaborating with the BCGEU to provide staff and members our special VIP card for veterinary services. RAPS Animal Hospital VIP Card provides you with an additional 25% OFF our already competitive low prices for in-house veterinary services each time you visit the RAPS Animal Hospital (the “benefits”). THIS IS A TIME LIMITED OFFER (sign up by the 5PM Pacific Time of Dec. 31, 2019). 100% of the proceeds from your visit will go towards saving more animals and helping to fully or wholly subsidize the public with their animal healthcare needs. In 2018 (our first year of operations) RAPS Animal Hospital provided $400,000 in community support to people in need and to animal rescue agencies. We hope to double that number is 2019. ​This offer extends to in-hospital services only. To receive the benefits in 2019, you must complete registration for your VIP Card no later than 5 p.m. (PDT) on December 31st, 2019. RAPS, at its sole discretion, and in RAPS' best judgement, may refuse to accept you as a member for these benefits or as a client of the hospital. RAPS reserves the right, at its sole discretion, to refuse any person services at the RAPS Animal Hospital. RAPS reserves the right, at its sole discretion, to revoke VIP privileges, without liability to RAPS, of any person. The benefits are strictly for internal RAPS services only. RAPS reserves the right at its sole discretion to determine what services are included or excluded as part of the benefits. Veterinarian and other staff time charged in providing care to your animal. On a case-by-case basis based on the cost RAPS must incur in the treatment of your pet. Any external charges incurred by RAPS Animal Hospital from outside suppliers are not included (examples such as tests that are unavailable at the RAPS Animal Hospital, external specialists or outside diagnostics). Any products or materials (such as pharmaceuticals, pet foods, medications and other products prescribed or advised for your pet). Elective services requiring payment by RAPS to third parties (example: external blood analysis, external x-ray reviews, external ultrasound specialists or other external medical consulting specialists). You agree to have assigned all your animal's medical files to the RAPS Animal Hospital and are a legal agent of the pet(s) in your care. You certify that you are over 18 years of age, and that you have authorization to treat the pet in your care. VIP membership benefit is a privilege, not a right, provided by RAPS to individuals on a case-by-case basis at the sole discretion of RAPS. RAPS may change the rules for membership or the benefits of membership at any time, without liability to you, without prior notice to you and at the sole discretion of RAPS. VIP membership is subject to the rules listed on the RAPS website and it is your sole responsibility to read these rules and abide by its regulations. Upon becoming a VIP member, you will be given a specific account number. You agree that this VIP membership privilege will only be used by you for animals that are legally your responsibility. You agree not to share your VIP membership with anyone and will restrict all use of the VIP membership for your own personal use. You agree that any abrogation of these rules or misuse of the VIP membership are grounds for expulsion from the benefit program and, at RAPS' sole discretion, expulsion from any and all benefits offered by RAPS at the RAPS Animal Hospital. You must tell us immediately of any unauthorized use of your VIP benefits that comes to your attention. We may suspend or terminate your benefits account if it appears to us that you are, or your account, has been used, in breach of these terms (including by providing false registration details or other misuse of the VIP membership benefits program). You agree that you will not attempt to interfere or hamper, in any way, with the proper operations of the RAPS Animal Hospital. Membership in RAPS Animal Hospital VIP program is open to all residents of Canada who are 18 years of age or older. Only one membership is available per customer. Membership is not transferable. All VIP members must provide personal information as requested in the enrollment form. You agree that RAPS may communicate with you via all available online and offline communication tools, including via the postal system, email and via social media. VIP members must advise RAPS of any change in their contact information or email address or telephone number to keep their VIP benefits effective. VIP member cards and the VIP member numbers are for RAPS' references only at the RAPS Animal Hospital and cannot be used for any reason at the City Animal Shelter, the RAPS Cat Sanctuary or for any transaction outside the RAPS Animal Hospital. RAPS VIP membership has no monetary value. RAPS VIP membership card, email address and phone number must be presented at time of purchase to receive special member savings. Savings and special sales for VIP members will be announced through one or any or all of the following means of communication: Direct mail, online, email, text messages, posting on the RAPS Animal Hospital website or other means determined at RAPS sole discretion. It is the duty of the RAPS VIP member to locate RAPS VIP special offers. Subject to applicable laws, RAPS may, at our discretion, cancel, modify, restrict, extend or terminate the RAPS VIP program at any time without prior notice. In case of suspected fraud, misrepresentation, abuse, or violation of the rules, we reserve the sole discretion and right to take appropriate administrative and/or legal action, including the termination of your RAPS VIP member program participation. By entering your mailing address and/or e-mail address and/or phone number and/or cell phone number on the enrollment form, you agree to receive emails, text messages (standard message and data rates may apply), or similar electronic account messages about events and promotions from RAPS. You can withdraw your consent at any time and relinquish your VIP membership by calling, mailing or e-mailing the RAPS Animal Hospital. The RAPS VIP membership program is subject to all applicable laws and regulations and is void where prohibited by law. All interpretations of RAPS VIP membership program terms and conditions shall be at RAPS' sole discretion. RAPS' failure to exercise or enforce any right or provision of these rules shall not constitute a waiver of such right or provision. RAPS is not responsible for lost or stolen VIP membership cards. 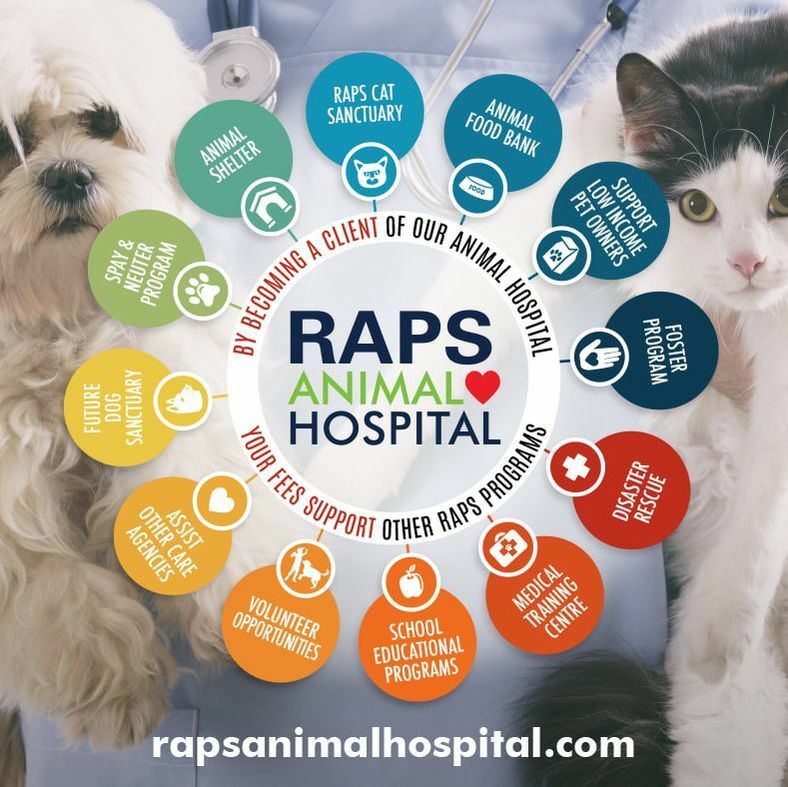 To enjoy the benefits of a RAPS VIP membership discount, VIP members must be present at time of purchase, must identify yourself as a VIP member at time of check-in at the RAPS Animal Hospital and agree that VIP membership benefits cannot be used in conjunction with any other discount or benefit offer. RAPS VIP membership is only valid on a year-by-year basis. You agree this is a privilege provided to you by RAPS and not a right and therefore the privilege can be revoked by RAPS at any time, for any reason, at the sole discretion of RAPS, without any liability to you. You agree that there are no financial damages to you from the cancellation of your VIP privileges. You agree to follow all the rules and regulations for proper conduct at the RAPS Animal Hospital. This includes proper animal conduct where dogs must be leashed, loud or aggressive dogs must be muzzled and cats must be caged. You are solely responsible for the behaviours and actions of your animals while under your supervision in the reception area, the waiting rooms and common areas. Audio and Video Surveillance. 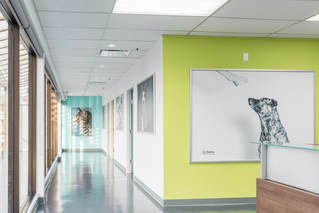 You agree and consent that all public areas and exam rooms of RAPS Animal Hospital are under audio and video surveillance at all times and that the footage from the audio and video surveillance may be used at RAPS' sole discretion for training or educational purposes and for legal and liability verification purposes at the sole discretion of RAPS. You agree that there are no privacy expectations by you both by audible or video representation for any interactions that occur at the RAPS Animal Hospital. Communications. I provide express consent for RAPS to contact me by phone, cell, text, email, via social media or any other available electronic medium, or by fax. Indemnity. Without limitation and in addition to any rights of RAPS against the client arising by reason of any breach of this Agreement, the client will be liable to RAPS (except for negligence on RAPS' part) for all losses, costs (including legal costs), damages and expenses that RAPS may suffer, sustain, pay or incur: and in addition will indemnify RAPS against all actions, proceedings, claims, demands, losses, costs (including legal costs). Remedies for Breach. It is understood that a breach of any of the covenants or provisions contained in this Agreement may cause RAPS to suffer loss or damage that could not be adequately compensated by monetary award or damages, and that, in addition to claiming damages or indemnity in respect thereof. RAPS will be entitled as a matter of right to seek an injunction or other equitable relief to prevent or cure any breach or threatened breach of this Agreement or to enforce specifically the terms and provisions hereof, and the client agrees RAPS will suffer irreparable harm as a result of a breach of any of the covenants or provisions contained herein, and the client consents to any preliminary or ex parte applications for such relief to any court of competent jurisdiction. Further, such right will be cumulative and be in addition to any other remedies which may be available to RAPS. Notices. Any notices to be given by either party to the other will be sufficiently given if delivered personally or transmitted by facsimile or if sent by registered mail, postage prepaid, to the parties at their respective addresses first written above, or to any other addresses as the parties may notify to the other from time to time in writing. This notice will be deemed to have been given at the time of delivery, if delivered in person or transmitted by facsimile. or within three business days from the date of posting if mailed from Richmond, British Columbia. Governing Law. This Agreement will be governed by and construed in accordance with the laws of the Province of British Columbia and the laws of Canada applicable therein, and the parties attorn to the exclusive jurisdiction of the courts of the Province of British Columbia and no other courts. Severability. If any provision of this Agreement is determined to be invalid or unenforceable in whole or in part, it will be deemed not to affect or impair the validity of the remaining provisions hereof. For the purposes of this section, "provision" means any severable section, sentence, phrase or word which least alters the intent of the parties to this Agreement. Modifications and Waivers. No modification or waiver of any of the provisions of this Agreement will be effective unless in writing and signed by the party consenting to the modification or waiver. No failure or delay by any party in exercising any right, power or privilege under this Agreement will operate as a waiver thereof, nor will any single or partial exercise of any right, power, or privilege hereunder. Perpetuity. Notwithstanding anything to the contrary in this Agreement, the obligations of the parties set forth in this Agreement shall be subject to each returning visit by the client to the RAPS Animal Hospital and remain in effect without limitation as to time until the client informs the RAPS Animal Hospital in writing at animalhospital@rapsbc.com that they are no longer a client of the RAPS Animal Hospital. CHANGES. RAPS reserves the right to revise or change the RAPS VIP membership program or membership rules at any time and without notice to you by posting updated text on the RAPS Animal Hospital website at www.rapsaniamlhospital.com. You are responsible for periodically visiting this site to view any changes. By your continued participation in the RAPS VIP membership program, you are hereby deemed to accept any changes or updates to the RAPS VIP membership program.